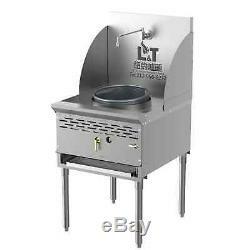 PANTIN Commercial 1 Burner 13 Stainless Steel Chinese Wok Range 125,000BTU. We are a leading supplier of 35 years of Commercial Restaurant Equipment manufacturing history with exceptional quality and affordable prices. We have a diverse product line that meets many of U. S and international quality standards such as NSF, UL, CSA, and ETL. Upgrade your kitchen by purchasing our standard products or get a free quote for custom made products today. We are excited to present our exclusive Compact Wok Range. The chamber is designed with a metallic mold unlke pure cement attachment of other market products. The space between the metallic mold and the chamber hole allows the heat to escape much easier, allowing a safer cooking environment. This item also has an automatic swing faucet, and pipe that runs inside to spray water on the surface to prevent the rise of temperature. We are the only one that manufactures this model. Please specify Gas Type: Natural Gas or Propane Gas. This item will be equipped with this burner. 16 Tip Jet Burner - Focused Fire. 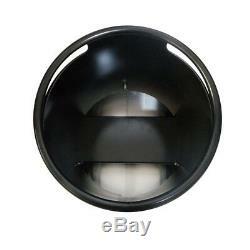 We accept E-Bay check out options&###xA0;of. &###x200B;&###x200B;&###x200B;&###x200B;&###x200B;&###x200B;&##x200B. Message us to make customized products that meets your needs! 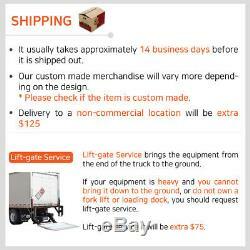 Your order dispatch will vary depending on the. For items directly in stock, it usually takes. Our custom made merchandise will vary more. &###x200B;&###x200B;&###x200B;&###x200B;&###x200B;&###x200B;&###x200B; Please check if the item is custom made. Lift Gate Service is Extra. &###x200B;&###x200B;&###x200B;&###x200B;&###x200B;&###x200B;&###x200B; &###x200B;&###x200B;&###x200B;&###x200B;&###x200B;&###x200B;&##x200B. You can return a product for up to 30 days from the date you received it. Any product you return must be in the same condition you received it, and in the original pacaking. Commercial kitchen equipment should be installed by licensed personnel. If there is a problem with the machine or installation, send us the service report with pictures or videos of the equipment and we will fix the issues. If unlicensed personnel tempers with the equipment, we are not liable and voids any warranties. Please be advised with model number and serial number if there are any issues with the merchandise or you with to return any items. We have the rights to change item details or cancel orders. &###x200B;&###x200B;&###x200B;&###x200B;&###x200B;&###x200B;&###x200B;&###x200B;&###x200B;&###x200B;&###x200B;&###x200B;&###x200B;&###x200B;&###x200B;&###x200B;&###x200B;&###x200B;&###x200B;&###x200B;&###x200B;&##xA0. Description We are excited to present our exclusive Compact Wok Range. 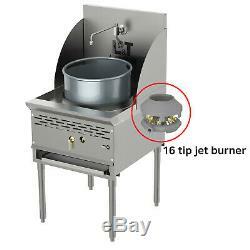 Please specify Gas Type: Natural Gas or Propane Gas This item will be equipped with this burner. The item "PANTIN Commercial 1 Burner 13 Stainless Steel Chinese Wok Range 125,000BTU" is in sale since Wednesday, November 21, 2018. 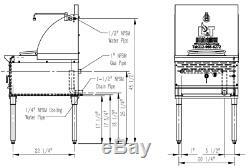 This item is in the category "Business & Industrial\Restaurant & Food Service\Commercial Kitchen Equipment\Cooking & Warming Equipment\Ovens & Ranges\Ranges". 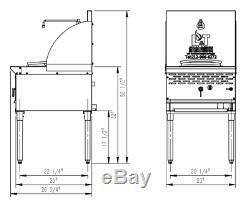 The seller is "ekitchensupply" and is located in New York, New York. This item can be shipped to United States. Chamber Sizes (Left to Right): 13"